The pine trees come from my friend Bob Mitchell at Perfect Pines. Most of the rest of the foilage is from Woodland Scenics products. I built it using Woodland Scenics plaster cloth over taped newspaper and strip cardboard forms (I hate foam and rarely use it - awful nasty stuff; breathing the dust will harm your health, so cut it with a knife). I then added plaster rock castings cast and colored at my workbench and attached and blended the castings in using lightweight spackle. Spackle forms the rest of the ground which is textured while wet with stiff brushes and palette knives and then painted with acrylic colors. Rocks, sand and dirt from Arizona Rock & Mineral Co are added to get the right color and texture for the ground. At this point the track is ballasted so it will spill over onto the ground instead of the other way around. I like to use real rock ballast so I either use Arizona Rock and Mineral Ballast or Highball products ballast. 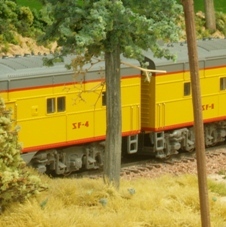 The Woodland Scenics ballast is too light and floats away when you try to stick it down with scenic cement. It is very hard to get nice looking slopes when your ballast floats on water! Foam bushes in a variety of colors and Silflor grass are added, are added last and everything attached with Scenic Cement. To make my bushes I mix several colors in a tub, add light brown coarse ground foam (for dead leaves) with a bit of light green foam (for new leaves) to make highlights, and mix it all up. The bushes look a lot better this way if they are not all one color only. The best conifers I have seen that you can buy, as opposed to making yourself, are from Canyon Creek Scenics. What is really cool is that they make non-ordinary trees, such as double-trunked (such as the tree on the left), dead, burnt, and so forth. These foreground trees are too expensive to buy a whole forest (at least for most of us), but adding a few in special locations in front of the track adds a lot to scenes. You can also move them around for photos. These trees have lots of lower branch details. You can also add lower branches to other manufactured trees with a pin to make a hole and some glue such as I did the the Perfect Pines tree on the right. This adds a lot to the tree. Silflor is easier - you just peel it off the backing sheet and stick it down. Like all scenery make it permanent with scenic cement. Again the colors never weem right to me but I have found to color it all you need to do is dab some thinned paints onto it until it looks right. This has the advantage of breaking up the monotone color that it comes in. Buy the lighter colored and add color and you will only need to buy one color.